Between November 8 and November 9, two major announcements made headlines across India and nothing has been the same ever since. When Prime Minister Narendra Modi announced the government’s ‘surgical strike’ against black money hoarders and corruption by demonetising existing Rs 500 and Rs 1,000 notes in a matter of hours, many were stunned to silence, just before the panic set in. Follow that with Donald Trump winning the US presidential elections half way across the world, and one started to question what was happening in the world. But then, the signs for the Trump win were there – mystical signs, that is. Just a day before, Chanakya the Chennai-resident clairvoyant fish had predicted the Republican candidate would win. So did Bulgarian Baba Vanga, 20 years ago! And yet, none really took them seriously. Well, turns out, Trump’s win wasn’t the only event that was predicted. 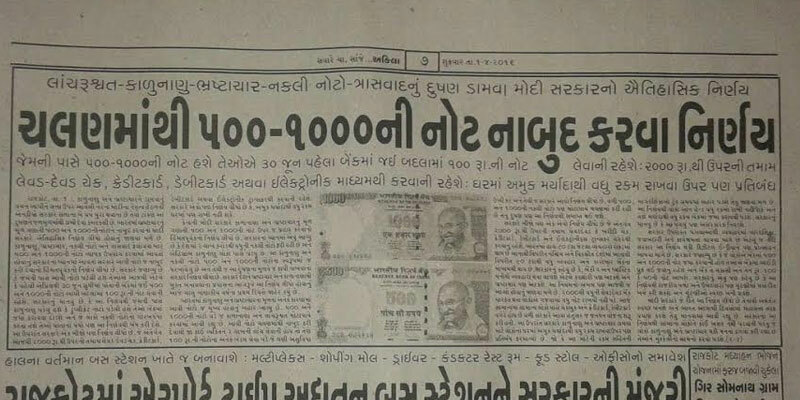 On April 1, 2016 (yes, that is the date), a Gujarati evening newspaper Akila ran a story that said that the government, on completing two years, is removing the Rs 500 and Rs 1,000 currency notes from circulation in a bid to end corruption and black money hoarding. The report was published with the headline “Chalan Maathi 500-1000 ni note naabud karnwa nirya”. The story said this was a historic decision against bribe, black money, corruption, fake currency and the evil of terrorism. Well, the shock doesn’t end there. The report was, in fact, meant to be an April Fool’s Day prank by the Rajkot-based paper! Now, it’s not uncommon for newspapers to pull a fast one on their readers by inserting fictitious news reports in the April 1 edition, but this seems just too fantastic – especially in post-November 8 India. This was first identified by The Telegraph, to whom Akila editor Kirit Gantara categorically clarified that it was meant to be a prank. “It is just a coincidence that the Modi government took such a decision. It’s a sheer coincidence…This is what we did on April 1. It was not a genuine news report.” Gantara said. indianexpress has not been able to independently confirm the news report. Well, between The Simpsons, Paul the Octopus, Baba Vanga the clairvoyant, Chanakya the fish and now Akila the newspaper, it seems the mystical force is getting stronger with each passing year. Also, we definitely need to keep a better watch on stories being published on April 1 from now on!